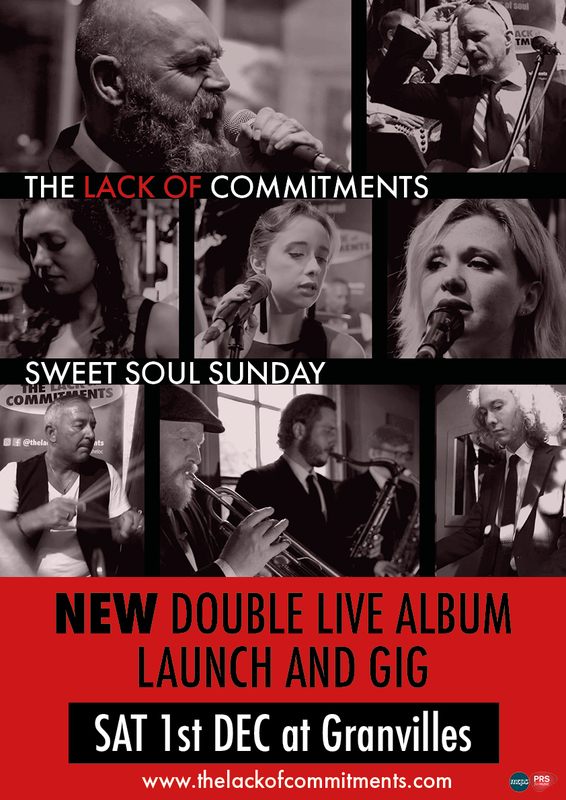 NOW AVAILABLE: Sweet Soul Sunday – the new double live album from The Lack of Commitments. Sweet Soul Sunday, a double CD album with 30 tracks featuring audio from two gigs. The Sweet Soul Sunday event at Granvilles and live at Kidsgrove Town Hall, both recorded live in Sept 2018. Recorded and produced by Dave Patrick, with artwork from David Wild. The album is a double gatefold, 4 page booklet with two vinyl-style CDs. From the Sweet Soul Sunday event: Our gratitude to Paul Franklin, Adam and Mandy Jones at Granvilles, Phil Dann, Will Hack at Inspire Generation, Thomas Karklins, Ben and Macauley at Indigo Buteo video, Emma Joustra Portraits. The LoC are proud to support The Donna Louise Hospice. Thanks to Amanda Cartwright at Kidsgrove Town Council.